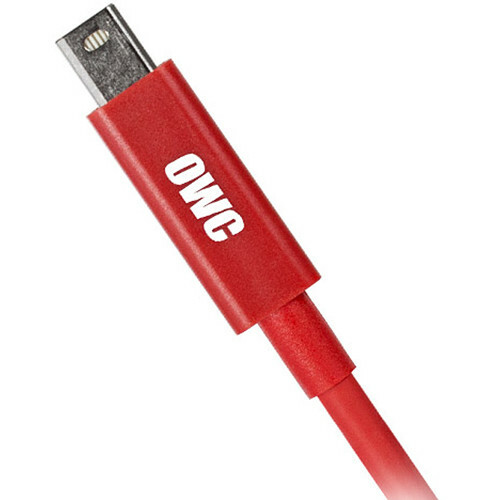 The red Thunderbolt Cable from OWC / Other World Computing has a length of 6.6' and is designed for Thunderbolt-based production workflows and data needs. It enables you to connect Thunderbolt-equipped systems with Thunderbolt-compatible peripherals, such as hard drives, displays, video capture devices, docks, and more. This cable is compatible with 20 Gb/s Thunderbolt 2 technology and 10 Gb/s Thunderbolt technology, offering bi-directional channel bandwidth for both standards. Thunderbolt technology also supports 4K video transfers and workflows, as well as 4K displays via DisplayPort 1.2 video outputs. Box Dimensions (LxWxH) 4.7 x 4.7 x 0.4"
Thunderbolt Cable (6.6', Red) is rated 5.0 out of 5 by 7. Rated 5 out of 5 by ososinpelo from Excellent Thunderbolt cable I purchased this cable to transfer files from a older dead MacBook Pro to a new one in Target Disk Mode. The cable is of excellent quality and I have always been greatly impressed with both B&H Photo and OWC products. Rated 5 out of 5 by David from Red Thunderbolt I really enjoyed getting a red thunderbolt cable. I was surprised at how thin it is. It does its job flawlessly. Rated 5 out of 5 by Samir from Very flexible and reliable Hello Universe) OWC cables are very durable, thin, high-quality, and pleasant to the touch. Thank you B&H! Rated 5 out of 5 by Filmguy from Good Thunderbolt cable Good firm connection and the perfect length for me. Transmits data as expected. Rated 5 out of 5 by John from Great when you need extra length I need something longer than the few 3 ft cables I have. Good quality. Rated 5 out of 5 by Luis from Works as expected. OWC products are great.